See a sunflower grow from seed to seed. 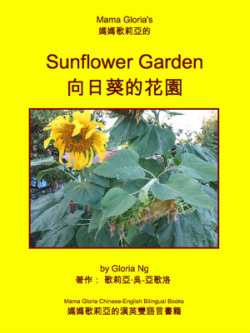 Mama Gloria Chinese-English Bilingual Books are a great introduction to high-interest topics for early readers. Each page has full-color photographs that go with the story and also highlights useful words. Text is shown in traditional Chinese characters, Mandarin pin yin, simplified Chinese characters, and English. In addition to a list of useful vocabulary, at the back of each book are links to bonus audio files in Cantonese, Mandarin and American English read by the author at a slow pace for easy-to-use reference. These audio files are designed for older readers, such as adults, to read alongside early readers as young as from birth. Use the following tips to maximize the use of each book and make them family favorites. For newborns (0-6 months old): Instead of reading the text on the whole page, just point to the object that is on the page or a certain word that describes the object on the page. For preverbal, babbling stage (6-12 months old): Continue to use the objects on the page. Try reading the whole sentence aloud and see how your child responds. For toddlers (12 months-36 months): The older your child gets, the more you can start bringing more attention to the actual words on the page. You will be surprised at how well your child fares with whole word recognition. For preschool and kindergarten: You can definitely start teaching spelling of the English words and how to even write some of the Chinese characters with their developing fine motor skills. 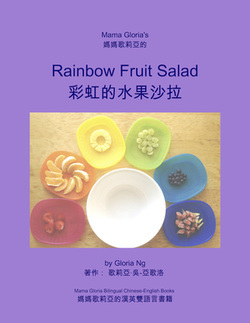 Learn how to make a bowl of colorful fruit salad!